What is the anti aging secret weapon? It’s water. Yes, plain old water – our best friend in the battle to restore or hold on to our youth. Without water there would be no life. It’s that important. Water is something that NASA looks for on new planets to establish whether there might be life on the planet. Although for humans, oxygen is a more urgent need and we would die very fast without it, there are known forms of life that do not need oxygen or even are poisoned by it. But every living thing needs water. Water makes up 55% to 75% of the human body, depending on a person’s build and size. It is essential for all of our metabolic processes. It helps transport nutrients and eliminate toxins. These substances are dissolved or held in suspension by our bodily fluids that are mostly water, and carried around the body. Water is important for a healthy colon, kidneys, liver, brain and just about everything else. Everything we eat and drink contains some water, even the driest cookie. But we also lose water all of the time, not only when we go to the bathroom, but in evaporation from our skin and in every exhalation. You know how a mirror steams over when you breathe on it? That’s the airborne water in your breath condensing on the colder surface of the mirror. This water must be replaced, and the best way to do it is simply by drinking pure water. 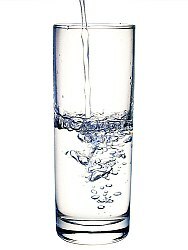 Staying well hydrated by drinking lots of water is particularly beneficial to the skin. In fact, washing toxins from the skin is more effectively done by drinking lots of water than by showering. Showering only cleans off the perspiration and other substances. Making sure we are never short of water on the inside, however, dilutes and washes away toxins in the pores and at the same time, moisturizes the skin, helping it to look younger and reducing wrinkles. There is also research to show that drinking plenty of water can help to prevent many of the diseases that we associate with aging. Not drinking enough can contribute to high blood pressure and high cholesterol which in turn are factors in heart disease, stroke and Alzheimer’s disease. Some people become concerned that they may suffer from water retention and bloating if they drink too much water. This is not going to happen. A healthy body will expel all the water that it does not need and flush out waste along with it. Water retention is caused by other factors. If you suffer from bloating, you should still drink plenty of water, otherwise there will be a buildup of waste and toxins in your body that will only make things worse. The latest recommendation from the US National Research Council is that the average woman should have 2.7 litres of water per day and the average man 3.7 litres. This depends on body size, so a large woman would need more, a small man would need less. Women also need more if they are breastfeeding. People also need more in hot temperatures or if they are very physically active. We get 20% of the water that we need from food, so after subtracting that, the National Research Council’s figures mean that we should drink about 2.1 litres for a woman (9 x 8 oz glasses) or 3 litres for a man (13 x 8 oz glasses). Sounds like a lot, doesn’t it? But it’s worth it! If you are not drinking near that amount right now, you are sure to have some health benefits from increasing your consumption of liquids. You will probably also find yourself looking younger and feeling fitter. Just be sure not to drink too much at once. Spread your intake through the day. It doesn’t have to be just water. Other drinks will count toward your daily intake, except for anything containing alcohol, which dehydrates the body. Sodas are best avoided too, because they usually contain either a lot of sugar which is not good for our health, or sugar substitutes and additives which can be dehydrating. But juice, milk, and even tea and coffee are fine. Still, it’s plain old water that is the purest way to treat your body with this anti aging secret.